In the five years he was in office, President K R Narayanan had to face knotty questions of constitutional law and practice, which had serious political implications. He had to dissolve the Lok Sabha twice, in 1997 and in 1999; swear in a Prime Minister on as many occasions; twice decline the advice of the council of ministers to impose President's rule -- in Uttar Pradesh in 1997 and in Bihar in 1998. He was constrained more than once to express his anguish at what was happening in the country and to caution against any radical change of the Constitution. This did not endear him to some. Two political parties, in particular, resented his actions. Under the Constitution of India, the President "shall, in the exercise of his functions, act in accordance with" the advice of the council of ministers, headed by the Prime Minister (Article 74 (1)). However, it is open to him to require it "to reconsider such advice." If reiterated, the President will be bound to act in accordance with the advice "tendered after such reconsideration." Article 78 empowers the President to seek information on the affairs of the Union and makes it the Prime Minister's duty to keep him informed. Ours is a Parliamentary system based on the British model. As Dr B R Ambedkar told the Constituent Assembly on December 30, 1948, "Under a Parliamentary system of government, there are only two prerogatives which the King or the head of State may exercise. One is the appointment of the Prime Minister and the other is the dissolution of Parliament. With regard to the Prime Minister, it is not possible to avoid vesting the discretion in the President." The President's discretionary power, his prerogative, comes into play, if a general election returns a hung Lok Sabha in which the majority is uncertain or the coalition that claims a majority insecure. Likewise, if the Prime Minister advises dissolution of the Lok Sabha though the Opposition is able to form an alternative government. President Narayanan's greatest legacy will be the practice he followed of explaining in detail to the nation, through a Rashtrapati Bhavan communiqu�, the reasons behind his decisions. This is a precedent in the fine traditions of democracy that no successor can ignore. Just three months after he assumed office, President Narayanan was confronted with a letter from the leader of the Congress Party, Sitaram Kesri, on November 28, 1997, withdrawing support from prime minister Inder Kumar Gujral's United Front government with 'immediate effect.' Kesri also staked claim to form the government. Deciding on the first point was easy, since Gujral promptly resigned. 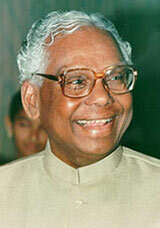 Narayanan consulted leaders of other parties as far as Kesri's claim to form the government was concerned. Meanwhile, Gujral advised dissolution of the Lok Sabha. The President accepted the advice, since he found Kesri could not substantiate his claim of majority support. He issued a long statement, running into 20 paragraphs, recording each step and explaining his decision to dissolve the Lok Sabha. After the 1998 general election, Atal Bihari Vajpayee staked claim to form the new government. The BJP had emerged as the single largest party and led a pre-election coalition that had a majority in the House. The President demanded proof in the form of letters of support. They were duly furnished. On March 15, 1998, Rashtrapati Bhavan issued a detailed communiqu� explaining the President's decision to appoint Vajpayee as Prime Minister, subject to his securing a vote of confidence on the floor of the House within 10 days of his being sworn in. This government was defeated on a motion of confidence that was put to vote in the Lok Sabha on April 17, 1999. The President was criticised for insisting on the vote, but his action was justified. The NDA government had come to power on the strength of a letter of support from, among others, AIADMK leader J Jayalalithaa. She later wrote to the President withdrawing her support. The government had manifestly lost a majority. President Narayanan's decision was vindicated in the Lok Sabha even though the government was defeated by a single vote. Sonia Gandhi, leader of the Congress (I), claimed a majority on April 21 but admitted her failure four days later. On April 26, the President dissolved the Lok Sabha. Once again, a detailed communiqu� from Rashtrapati Bhavan set out each step in the process of consultation, spread over a week. In the general elections held later that year, the NDA returned to power. President Narayanan twice declined to act on advice to impose President's rule and asked the council of ministers to reconsider it. He first did so on October 22, 1997, when the United Front government advised the imposition of President's rule in Uttar Pradesh. Samajwadi Party leader Mulayam Singh Yadav, who was also Union defence minister, was most upset and the BJP supported him. Later, on September 25, 1998, the President declined the NDA government's advice to impose President's rule in Bihar, causing the BJP much heartburn. However, he accepted similar advice on February 12, 1999, in the aftermath of the Dalit massacre in Bihar on January 25 and February 10-11, 1999. But the Rajya Sabha refused to ratify the Proclamation and the ousted Rabri Devi government was reinstalled in less than a month, to every one's embarrassment. The President's expressions of anguish and pain in January, 1999, on the murder of missionary Graham Staines and his two sons and, last March, on the carnage in Gujarat did not endear him to the government. It is only fair to mention that President Narayanan has not been altogether free from blame. He took interest in appointments to posts in the judiciary and government which was excessive and, in at least in two cases -- concerning his daughter's appointment as ambassador to Sweden and his secretary Gopal Krishna Gandhi's appointment as high commissioner to Sri Lanka -- improper. On March 21, 2000, he delivered a controversial speech at the banquet in honour of then US president Bill Clinton, which departed from the government's line. This, too, was improper. However, his achievements overshadow his lapses.